The elder statesman has always insisted on the importance of unpredictability, even irrationality, in diplomacy. One of two things happened: Either Kissinger was sandbagged by Trump—after all, he’d spent weeks making the case that Trump might prove a stabilizing influence, capped by his Beijing conclave, only to be caught off guard by the paradigm-shattering call from the Taiwanese president. Or Kissinger was in on the stunt, playing the sober realist to Trump’s reckless adventurism, helping Trump to establish dominance, to lay down a strong opening bid for future negotiations. So here we are, weeks before Trump is even inaugurated, tottering between “stability” and “unpredictability,” between world order and world war. Kissinger’s sweet spot. Trump has called. Kissinger has come. And we should be worried. 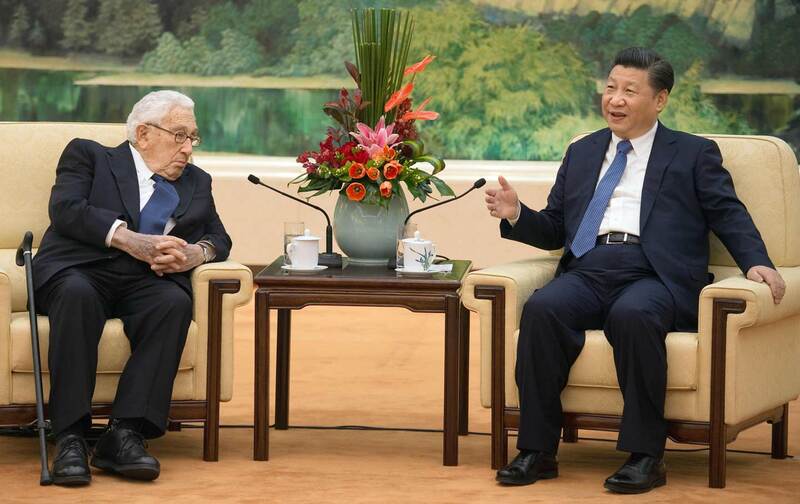 Here’s why: For all of his reputation as a realpolitiker concerned with, as he told Xi, sustainability and stability, Kissinger has over the course of his career insisted on the importance of creative and unexpected responses to crises—exactly the “unpredictability” that Trump both values and performs. “Unpredictability,” according to Kissinger’s philosophy of history and diplomacy, is needed for a number of reasons. The greatest of great diplomats, Kissinger has written, are the men who shake up their foreign-policy bureaucracies, which over time inevitably become ossified, too beholden to past policies (say, like Washington’s One China policy) and too dependent on “experts,” who, deeply versed in the particularities of their particular region, inevitably advise caution rather than action. True leaders, Kissinger says, never let themselves become paralyzed by a “pre-vision of catastrophes.” They are agile, thriving on “perpetual creation, on a constant redefinition of goals.” “Those statesmen who have achieved final greatness did not do so though resignation, however well founded,” Kissinger once wrote; “It was given to them not only to maintain the perfection of order but to have the strength to contemplate chaos, there to find material for fresh creation.” Starting to sound familiar? Kissinger was more than willing to oblige. “Toughness” was a leitmotif that ran through much of his statecraft, the idea that war and diplomacy are inseparable and that, to be effective, diplomats need to be able to wield threats and offer incentives in equal, unrestricted, measure. In fact, the madman theory was a logical extension of Kissinger’s philosophy of the deed—the idea that power isn’t power unless one is willing to use it, that the purpose of action is to neutralize the inertia of inaction. “How can you conduct negotiations without a credible threat of escalation?” Kissinger asked the defense analyst Daniel Ellsberg on Christmas Day 1968, a month before Nixon’s inauguration. Kissinger had asked Ellsberg to put together a position paper outlining possible alternatives for Vietnam, which Ellsberg did. But he didn’t include a “threat option” in the paper. “People negotiate all the time without threatening bombing,” Ellsberg said dryly. Within days of Nixon’s January 20, 1969, inauguration, Kissinger asked the Pentagon to tell him what his bombing options were. He and Nixon wanted to start striking North Vietnam again, but that would have been hard to pull off given public opinion. The next best option was to bomb across the border in Cambodia, to telegraph to North Vietnam Nixon’s “unpredictability.” “Hit them,” Kissinger told Nixon, ten days before the bombing started, and then ask North Vietnam “for private talks.” American bombing of Cambodia, Vietnam, and Laos went on for five years and killed hundreds of thousands of people, even as North Vietnamese diplomats in Paris ran rings around Kissinger in negotiations, winning the war largely on their own terms. There’s been a lot of talk since this year’s election regarding the “spectacle” of Trump, trying to figure out the “true” motives behind his “reckless” tweets and phone calls, and to what degree they contribute to a post-truth political culture. To some extent, this misses the point. Spectacle is content. I’m going to get around to writing a longer post that relates postmodernism to postwar US militarism (Richard Kreitner just reminded us that the phrase “post-truth” was first used in reference to Iran-Contra, in The Nation). But here let me just finish by pointing out that to let “slip” the fact that Nixon was obsessed with Communists, that he can’t be restrained, was a kind of action, a good example of what the philosopher of language J.L. Austin, writing just a few years before Nixon’s inauguration in a book called How To Do Things with Words, called a “performative utterance.” By this, Austin meant that most examples of language do not represent an objective action and therefore can’t be evaluated in terms of whether they are true or false. Speech itself is the action. In arguing against the “true/false fetish” (the idea that communication—symbols, utterances, and gestures of the kind that Nixon hoped to convey to the North Vietnamese—conveys truth), Austin wasn’t making any claims about morality and politics. But his work on language was part of a broader intellectual reaction to postwar positivism, very similar to Kissinger’s critique of game theory and bureaucracy and embrace of extreme subjectivism, as I’ve tried to show in Kissinger’s Shadow. In fact, Austin’s insistence that performative utterances are always “hollow or void” captures the emptiness at the center of Kissinger’s relativism—and, by extension, the emptiness at the center of American militarism. That emptiness has led to a kind of consistency: From his undergraduate thesis to his most recent books, Kissinger has argued for the importance of creative and unexpected responses to crises—in effect, performative utterances that would telegraph to adversaries and allies (much of Nixon’s and Kissinger’s foreign policy was performed to satisfy the rising domestic right in the United States) his seriousness of purpose. Yet despite this call for constant innovation, the arguments he has made for any given escalation, be it in Southeast Asia in the 1960s, or in Southern Africa in the 1970s, or, 30 years later, in the Middle East, have been predictably similar: We need to act to establish credibility, to back up diplomatic overtures with military might, to strengthen resolve, to avoid inaction so as to demonstrate that action is possible. In a way, then, Donald Trump is Kissinger’s ultimate speech act. But reality has a way of asserting itself. Kissinger, in presiding over the bombing of Cambodia, Laos, and Vietnam, helped transform Nixon’s madman policy from performance—an act meant to convey insanity—into an actual act of moral insanity: the ravaging of three countries for no effect whatsoever except the ravaging.